A four-year-old girl with a wild imagination, a small neighborhood, a crazy family, and gullible friends sound like the makings of a great comic strip. That is why Cul de Sac by Richard Thompson has become such a success and was published in over a hundred newspapers, including the Washington Post, and in several books. Little Alice Otterloop stars in Cul de Sac as a brown-haired preschooler with an imagination that turns her own grandmother into a witch who tempts the unwary to their doom. Alice treats life like a game, and often her antics exasperate her family and friends. Alice’s elder brother Petey is obsessed with becoming the pickiest eater in the world and also has severe allergies, to most things in general, fears sports, loves to read about a comic book character named Neuro, and possesses an imagination almost as lively as Alice’s. Then there’s Mrs. Otterloop. 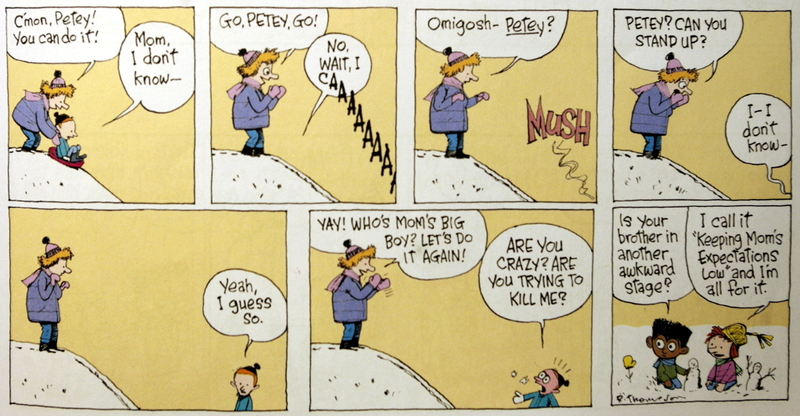 She’s not the typical down-to-earth comic strip mother who becomes exasperated at her children for their craziness, like Calvin’s mom in Calvin and Hobbes, the mother in Zits, or Hammie and Zoe’s mother in Baby Blues. Mrs. Otterloop enjoys jokes and strongly encourages her children, oftentimes too strongly. Mr. Otterloop is the most sensible member of the family, yet even he has his odd streaks, which cause him to make crazy jokes that none of his children understand. Dill and Henri are Alice’s neighbors and best friends. The three spend a lot of time together playing and sharing tall tales their elder siblings feed them. Finally, there is Mr. Danders, the talking school guinea pig, who suffers through life at Alice’s preschool and sometimes embarks on adventures of his own. Richard Thompson’s art style is unique. His drawings vary from rough pencil sketches to carefully crafted watercolors. The art animates the story and looks child-like, probably because the main character is a preschooler. Sadly, Richard Thompson stopped creating Cul de Sac on September 23, 2012, due to health problems. On the bright side, however, there are several collections of Cul de Sac available. These include: Cul de Sac: This Exit, Shapes and Colors, Children at Play, and Cul de Sac Golden Treasury. Those who enjoy Calvin’s wild imagination in Calvin and Hobbes or little Ruthie in One Big Happy will find these same elements in Cul de Sac, and, brimming with light-hearted entertainment that is relatable and humorous, this comic is a wonderful reading choice.